The original Watch Dogs met with a fair deal of negative response from gamers and critics alike. While I greatly enjoyed it, I was in the minority. Ubisoft listened to both the complaints and the praise Watch Dogs received. Watch Dogs 2 isn’t just going to please fans of the original; it’s going to please everyone. Ubisoft did a great job crafting Watch Dogs 2’s version of San Francisco. It’s bright, colorful and full of life, just like the real deal. All the important landmarks are there and captured in detail, like the Golden Gate Bridge, Alcatraz, Pier 39 and Lombard St. The team behind the game was clearly confident in their achievement too. 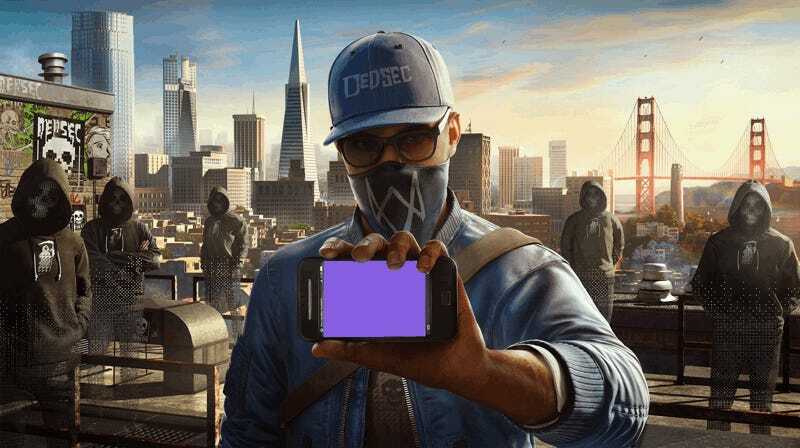 Watch Dogs 2 includes an Instagram-like app called ScoutX that encourages you to visit various landmarks all around the bay and Silicon Valley and take selfies. It’s not all about taking pictures, though. San Francisco has plenty to offer a hacker with time on their hands. Littered throughout the city there are various activities like races, data to collect, clothes to buy and side operations you can start by finding civilians in need of help. You can also taxi people in an Uber-like app called DriverSF. Each of these activities gain you followers and give you a chance to explore the city. During my time playing I found myself in awe of the sights around me. Unlike Watch Dogs’s Chicago, Watch Dogs 2’s San Francisco is bright and colorful. It’s a delight to run around and explore. Watch Dogs 2 ditches most of the original’s cast and the lone wolf vibe for more of a varied ensemble of characters. Each one is unique in their own way, but Marcus is, by design, the star of the show. He’s a young hacker who joins Dedsec at the beginning of the story. The rest of the crew is rounded out by Marcus’ inner circle. Sitara, an artist and equally talented hacker, Wrench, the hacker with that crazy mask you’ve seen in the trailers, Horatio, also known as Ratio is a friend of Marcus’ and Josh, the most brilliant of the group rounds out the rest of the Dedsec crew. Marcus does the bulk of the heavy lifting while getting support from his compatriots. Sometimes you’ll have a partner for your hijinks, but the majority of the missions you’ll be on are solo affairs. Each of the characters feels unique and has a personality all their own. Unlike the original’s protagonist, Aiden Pearce, Marcus seems more motivated by the desire to challenge himself to hack increasingly complex systems and uncover the misdeeds of large corporations. Aidan was more of a vigilante on a mission, where Marcus is almost more of a heroic figure, even if most of his deeds are definitely not on the right side of the law. Marcus is a much more likeable character, even if there’s little impetus for his mission to begin in the first place. He feels like much more of a hacker than Aidan, he’s a young nerdy hipsterish guy that is just oozing talent as opposed to a brooding tough guy. It really helps sell the image that Watch Dogs tries to put forth. The ideology behind Watch Dogs has always been centered on interconnectedness and the idea that someone could gain a back door to everything. The original laid a good foundation for that, allowing you to scan people to find out various personal tidbits about them, drain their bank accounts, and distract them with their phones. In Watch Dogs 2, all of this is greatly expanded upon. It’s now fully possible, and in many cases, even easier to take missions on without ever pulling a gun. Marcus has two RC vehicles at his disposal, a car and a drone, which he can use to scout around missions with far less chance of being noticed by enemies. Later on in the game you can unlock the ability to weaponize either of these vehicles so you can take out enemies if they spot you without getting directly involved. Watch Dogs 2 breaks out the approaches you can take into three play styles: Aggressor, Trickster, and Ghost. Aggressor is just what it sounds like, going on the offensive with guns and explosives. Trickster is using hacks to make others do your dirty work, like sending the police after your enemies or distracting them with phone calls or bugging their headsets to briefly incapacitate them. Ghost is all about stealth, using hacks in clever ways to make sure you or your gadgets remain unseen. There’s no decision to be made on which play style you’ll use, but as you unlock skills you’ll be informed which style that move enables the best. You can decide to infiltrate using some of your stealthy skills, then start randomly blasting people if that’s what you want to do. It’s nice to have choices. Personally, I thought it was extremely cool to be able to have my RC vehicles do the entirety of a mission for me then nonchalantly walk away, never having been even near my objectives. It’s the logical endpoint of what Watch Dogs is all about—hacking without any physical violence. Massive corporations can afford the muscle to protect their employees and their buildings, but in real life it has proven more than challenging to protect their data. Again, multiplayer is an improved version of what we got the first time around. Watch Dogs 2 touts seamless multiplayer, which is to say that as you’re out and about exploring San Francisco, you’ll encounter other players, some friendly and some not-so-friendly. Just like the original, some players will appear as members of the crowd, trying to steal data from you. If you manage to find them and take them out, you’ll gain followers. Other players will jump in and out of your game as it’s in progress. It’s a cool idea that wasn’t changed much from the original, save for adding some co-op missions and marking them clearly on the map for you to take part in. You can also access these from inside the game and consciously choose to pair up with friends. Driving was one of the worst points in the original Watch Dogs. It was easy enough to get by, but the police were a touch too sensitive and when trying to escape them it was difficult to maintain control of your car. Fortunately, driving has been completely reworked in Watch Dogs 2. Cars no longer feel like they’re hydroplaning and cops are no longer the omniscient beings they once were. In fact, in my playthrough car chases were few and far between, but the fact that traffic lights and underground steam pipes are hackable from the start make getting away a much easier feat than it was before. Cruising around San Francisco is a much more enjoyable than skidding around Chicago’s rainslick roads. Your mileage will vary here, but Watch Dogs 2’s soundtrack didn’t do much for me. There’s a lot of electronica and house music, as well as some classics from a mix of genres. Some tracks are absolutely great, while many left me wanting. You can listen to some built-in radio stations, similar to those found in GTA, or you can open the media player app on Marcus’ phone in game and cue up a song to listen to. It’s nice to have control, but I didn’t find myself playing with music on most of the time. Thankfully a few button presses are all that’s required to play in silence. A lot of Watch Dogs 2’s story elements are based on real-world news. An early mission sees you messing a corrupt pharma CEO’s attempt to purchase a rare rap album. Another has you fighting back against a politician trying to win an election using some underhanded tricks. The common thread throughout is that you’re fighting against Blume and ctOS, just like in the last game. Of course, with this taking place in technological capitol of the world, there are plenty of opportunities to make GTA-esque clones of some of the most famous companies in the tech sector, like Facebook and Google, to name a couple. The main theme of the story centers around how companies are using people’s data to manipulate them, and Dedsec’s attempts to return control of people’s personal data to them. It’s not a particularly riveting story, but it gets the job done. It’s all about a small hacker group gaining the ability to tackle some of the industry’s biggest players in a way that makes sense. Instead of leveling up and gaining experience, everything you do is to gain followers. Those followers are important because they’re part of your botnet. A botnet is a group of machines pooling their computing power to do things. Large hacking attacks in the real world routinely make use of botnets to pull of crippling DDoS attacks and the like. Think of it as an army of ants working together to take down a spider. As your botnet gets more powerful, you’ll take on hacks that are increasingly larger in scale. Eventually you’ll make your way to your logical conclusion. There’s not a lot of character development going on for Marcus and his friends, but what really matters is gameplay and Watch Dogs 2 has got it in spades. Two years ago, I said the original Watch Dogs laid a great foundation on which a potential sequel could improve. I’m really happy that I turned out to be right. Watch Dogs 2 retains all the best parts of Watch Dogs and improves on them. Conversely, it also cut out the parts that didn’t quite work. If you liked the original, this one is most definitely worth your time. Even if you didn’t, you should really try Watch Dogs 2 out.